All transactions are safe and secure with a reliable history in online purchasing behind each of our associates. Buy the Shredder Hoodie to own TMNT clothing and merchandise. 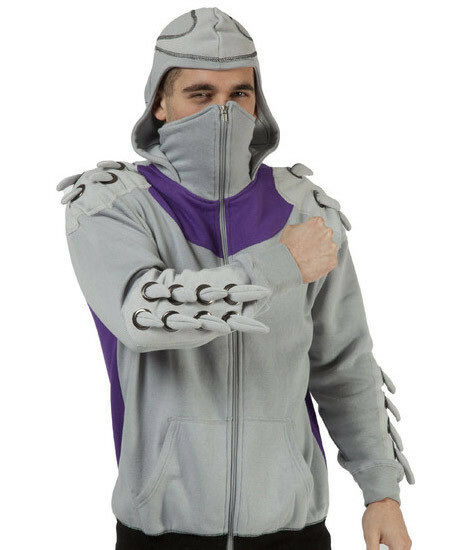 This impressive Shredder hoodie is fully equipped with a built in face mask and pointy spikes just like the real Shredder's costume. Not only is it a spunky hoodie that is bound to get some attention any day of the week, this hoodie could also be used as a simple costume. When you wear this hoodie, have four of your friends wear the Teenage Mutant Ninja Turtles costume shirts below and another one wear the Krang hoodie. If you don't dress up anymore, then any of the TMNT tees are nice casual additions to any wardrobe. Pick your favorite for yourself or give one to your friend as a perfect present. In addition to the Shredder Hoodie above, browse the TMNT Clothing Gallery for more apparel like men's and women's clothes, kids shirts or hoodies.